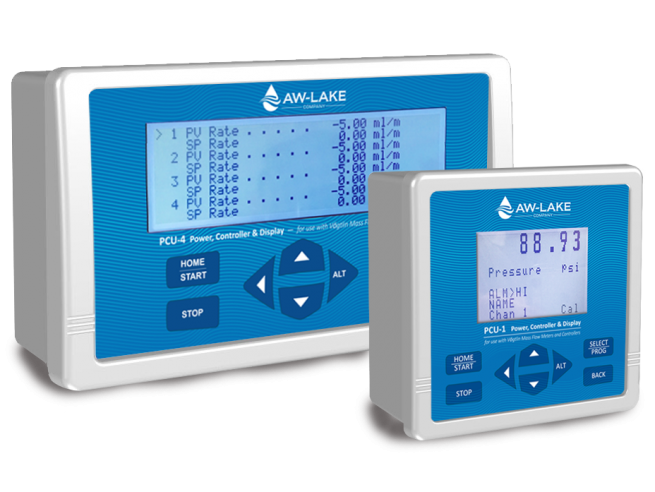 Ideal for use with Vögtlin Thermal Mass Flow Meters and Controllers to provide local display. The PCU Series of Controllers work with the Vogtlin brand of thermal mass flow meters and controllers to provide additional process control functionality, including batch, setpoint control, resettable dual totalizer, and valve override control (open, closed or normal). The PCU Series of Controllers work with the Vogtlin brand of thermal mass flow meters and controllers to provide additional process control functionality, including batch, setpoint control, resettable dual totalizer, and valve override control (open, closed or normal). PCU controllers are vailable in single channel or multi-channel units. Every unit comes with an RS-232 port, providing remote readout, set point control, and data acquisition information. Setup and operation is performed via the local keypad or using a standard RS-232 serial communication port connected to a computer or PLC. The instrument’s secure DA 15 connector allows for quick attachment to any thermal mass flow meter or controller. The PCU features a large, high-contrast backlit display, providing an easy-to-read view of the process variables and programmed set point for each connected device on one screen. Built-in diagnostic tests support easy installation and assist in ensuring a long, trouble-free operating life. Tests include overall system operating status, memory conditions, communication adapter status, display functionality, and keypad operation on every power-up. When the PCU unit is panel mounted, it is NEMA 4X rated, indicating it protects against environmental effects, such as rain, snow and ice. 15 to 24 VDC 2.0 w.